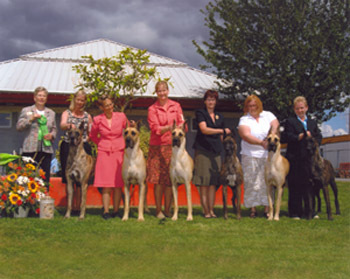 Handled by her breeder and co-owner Georgia Hymmen, Bebe came out of retirement on September 18, 2008 and entered the show ring competing in the veteran class at the Great Dane Club of Western Washington Specialty. Personally, I just wanted her to enjoy herself and of course win her class. But BeBe, Georgia and the judge had other ideas brewing. Bebe showed like the pro she is and was awarded “Best of Breed” by judge Noreen Cartwright. The following day at the second Specialty, BeBe was awarded “Award of Merritt” by judge Laurie Maulucci. I couldn’t be more proud of her!